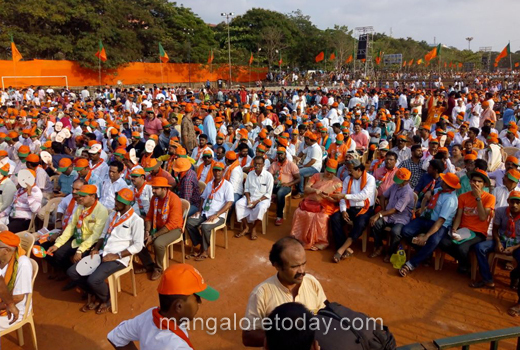 Mangaluru, May 05, 2018 : Prime Minister Narendra Modi is addressing his fourth rally today in Mangalore said, "the writing is clear on the wall, on May 15, BJP will form the government. Political pundits predicting a hung assembly should look at this crowd. 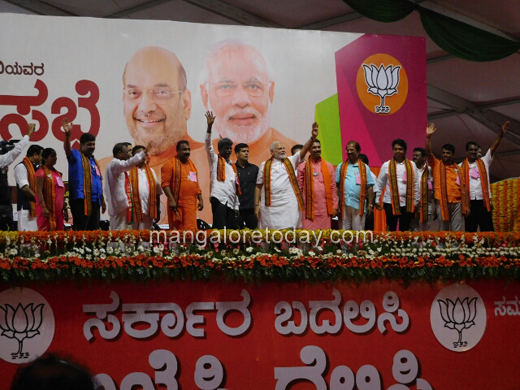 People of Karnataka will form a full majority government in favour of BJP". 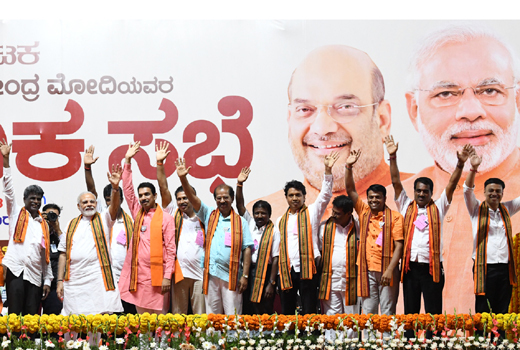 He launched a blistering attack on the Congress and accused the Siddaramaiah government in Karnataka government of indulging in organised loot. 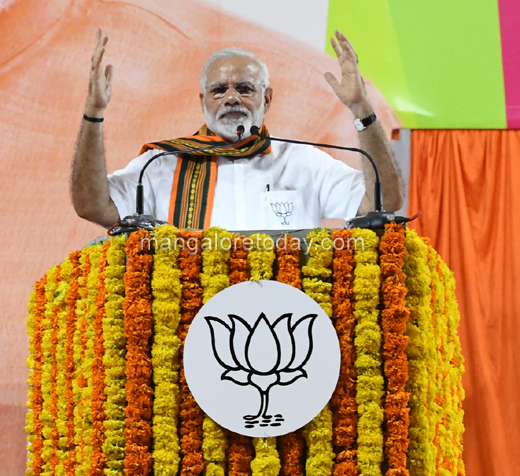 The PM said the Rahul Gandhi-led party has been rejected by the public in all elections and will soon be reduced from Indian National Congress to PPP (Punjab-Puducherry-Parivar) Congress. He claimed the Congress is worried over the imminent defeat in Karnataka Assembly elections. Praising the BJP-led central government’s initiatives, PM Modi said 30 crore families have bank accounts now through Jan Dhan Yojana. "We have brought them financial security," he said. Further, PM Modi reiterated his promise of providing a home for every family by 2022. "When India celebrates 75 years of Independence, every family will have a home in our country," he said, while accusing the incumbent Congress government in the state of not utilising the funds granted by the Centre for building houses. "Centre has given money to the state to build houses, but this state government is sleeping. Does it have the right to sleep?" he asked. PM Modi slammed the Congress for stalling the triple talaq bill in the Rajya Sabha. He said: "We have now brought a law. In Lok sabha, we passed it because we have a majority. But in Rajya Sabha, it is stuck because of Congress. Tell me, isn’t the Congress anti-women?" He also pointed out that through the Sagarmala project, his government is upgrading ports. 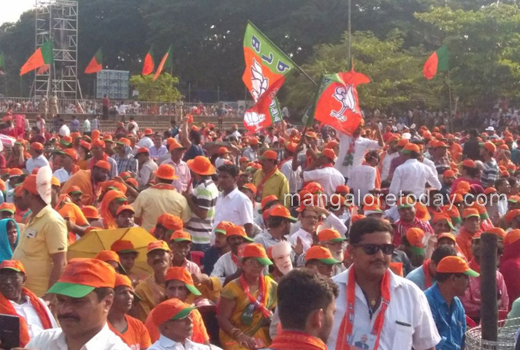 "It will have huge benefits for a coastal town like Mangalore," he said. He added that the Centre is working on 4 fishing harbours in the state, insisting that they have done immensely for the fishermen community. The Prime minister focused most of his speech on the achievements of the Centre and the failures of the Congress. 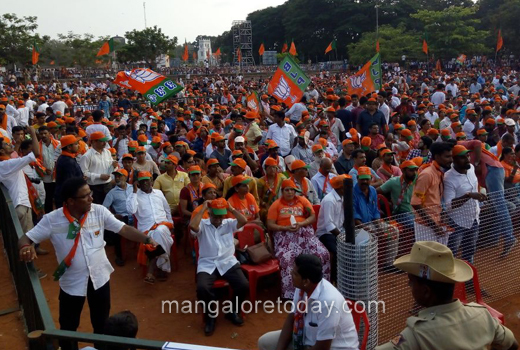 The political killings, which occurred in Dakshina Kannada, found mention in his speech. 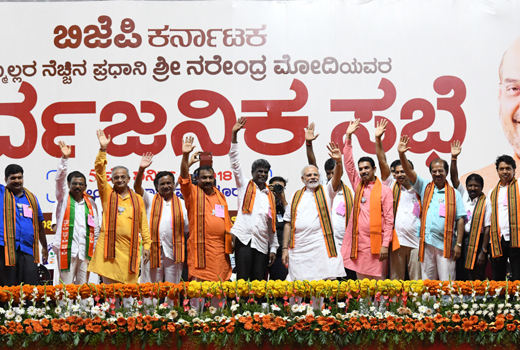 Some of his policies like the Ujjwala Yojana, DBT and Jan Dhan Yojana which find mention in almost every speech of the prime minister was addressed here too. He rejected the analysis of the political pundits that a hung assembly will develop post the elections. He said the mandate will strongly be in favour of the BJP. However, the party’s CM candidate was mentioned just twice in the PM’s speech. No other state leader was mentioned as well. There were no mentions of the achievements of the Yeddyurappa govt as well. 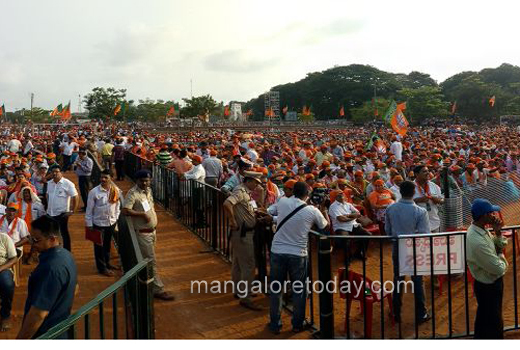 The Nehru Maidan, venue of the rally, was filled to capacity by BJP workers. 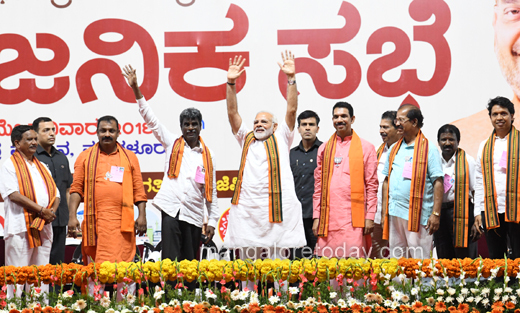 Earlier, as the PM started speaking, when a translator started translating his Hindi speech to Kannada, the crowds protested and shouted and eventually the translator was sent away. 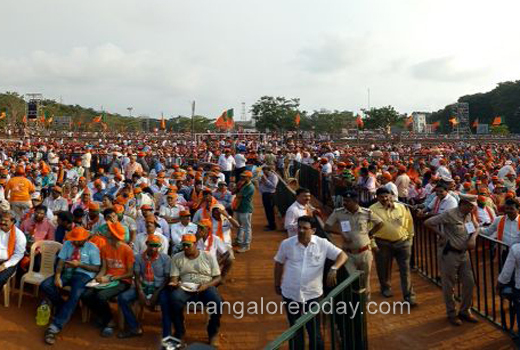 The PM’s rally was expected to address the voters of the two districts of Dakshina Kannada and Coorg. There are a total of 10 assembly constituencies in the two districts.